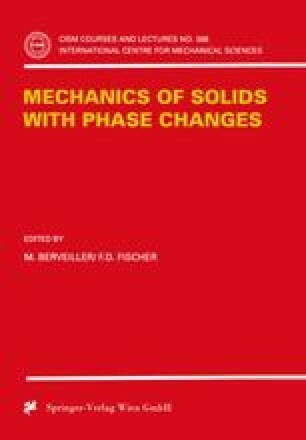 This chapter deals with the general aspects related to shape memory alloys and the TRIP phenomena. These two kinds of behavior originate from a particular solid-solid phase transformation: the martensitic transformation. First two parts of this chapter present the typical characteristics of this first order diffusionless and displacive transformation. Differences between thermoelastic and non thermoelastic martensitic transformation are underlined. In the third part the different behaviors observed in shape memory alloys are detailed (superelasticity, one way shape memory, two way shape memory, rubberlike effect and damping capacity). Physical strain mechanisms at the origin of these behaviors are defined. The last section is devoted to TRIP phenomena. Respective importance of nucleation and growth of martensite plates are discussed in this case. Plate morphology modifications related to evolution in the Bain strain accommodation mechanism in presence of an applied stress are pointed out.